Chlorhexidine, Dental caries, Streptococcus mutans (S. mutans), Simplified oral hygiene index (S-OHI), Alban test. The oral cavity is suitable for the growth of bacteria, and many resident flora are formed in it. It has been known that approximately 1,000 kinds of bacteria exist within the oral cavity, but the kind and percentage vary depending on the individual’s age, health state, diet status, or hygiene condition . With regard to oral health, an oral disease, dental caries, which is a global issue, commonly develops in children up to the elderly. Dental carries is an infectious disease accompanied by destruction, and the representative causative organism is Streptococcus mutans (S. mutans). In general, S. mutans is the most important factor in the formation of an initial biofilm, and is known to cause dental caries through the processes of attachment to the tooth surface, growth, and acid production . Therefore, to effectively prevent dental caries, the oral bacteria and the biofilm formed by them must be controlled. Therefore, while suppressing the growth and activity of oral bacteria, prevention and treatment of the oral disease are required. As the mouth rinsing solution is classified as a sanitary aid, it is easy to purchase, simple to use, and handy to carry. Thus, the mouth rinsing solution has been widely used as a sanitary aid . The mouth rinsing solution refers to a solution used for the purpose of oral hygiene management, as a management method of chemical dental plaque; helps in the prevention and control of dental caries and periodontal disease; and is effective for mouth freshness and for the temporary alleviation of halitosis . A compound that is currently widely used is chlorhexidine solution, a bisbiguanides agent . Chlorhexidine is an antibiotic that is used to extensively suppress gram-positive and negative bacteria, yeast, fungi, and anaerobic strains. It is also used to treat periodontal disease, acute necrotizing ulcerative gingivitis, aphthous stomatitis, and stomatitis caused by dentures, and is widely used as a disinfectant of the root canal [6,7]. There was a recent report on the antimicrobial effects of various natural products, but they were said to have a synergistic effect when used by being mixed with chlorhexidine, antibiotics, etc. rather than when used alone . As a side effect, however, it has been reported that the long-term use of chlorhexidine causes teeth and prosthesis coloration as well as dysgeusia and burning sensation of the oral mucosa . Nevertheless, it is an effective oral antibacterial agent that is currently being used in the clinical settings of many dental areas. Looking at the effects of chlorhexidine, the use of chlorhexidine solution has been reported to improve the oral health of the patients at an intensive care unit more than brushing . It is recommended as a chemical plaque control method when there is difficulty in brushing. In addition, in the study conducted by Houston et al. , between saline solution and 0.12% chlorhexidine solution, the latter reduced the incidence of oral bacteria more than the former did. In particular, if a patient’s mouth is gargled with chlorhexidine gluconate, the number of bacteria floating in the air during dental treatment will decrease, and consequently, the cross-infection between the patients and the dentists can be reduced . The result of inspecting the oral bacteria of the 27 pediatric patients in the experimental group who used chlorhexidine and of the 29 pediatric patients in the control group who did not use any antimicrobial agent showed that Staphylococcus aureus was most remarkably reduced and made to disappear by chlorhexidine, although the difference was not statistically significant . In the study conducted by Lee et al. , the difference in the incidence of oral bacteria between oral care using 0.1% chlorhexidine and that using tantum solution was not statistically proven, but the study revealed that there was a difference in the frequency of oral bacteria incidence. Chlorhexidine is currently commonly used in dentistry as a disinfectant after tooth extraction or periodontal treatment. Moreover, before and after scaling, it is applied to reduce the bacteria in the mouth. Chlorhexidine is well known to be effective primarily on periodontal disease, but there have been few studies on dental caries, which is closely associated with the plaque adhesion rate, the number of oral bacteria, the acid production capacity within the mouth, etc. Moreover, clinical data applied with a clinical approach are not enough. Therefore, in this study, a clinical trial was conducted to assess the potential of chlorhexidine for use in the prevention and treatment of dental caries, and to investigate its effect on the development of dental caries. This study was conducted after obtaining the approval of the IRB of Inje University (No. 2-1041024-AB-N-01 – 20140514- HR-055-04; approval date: 2014-08-27). The study enrolled patients who visited the M Dentist Office located in Busan from September 2014 to January 2015. A dental hygienist with a more-than-10-year career directly explained the purpose of the study. Of the 16 patients who agreed to fill out the questionnaire, the study was conducted in the 12 patients who did not have a systemic disease and whose data were complete. For the six subjects in the 0.9% saline solution (JW Pharmaceutical) group and the six subjects in the 0.005% chlorhexidine (Bukwang Pharmaceutical) group, before mouth gargling, the dental caries variables were checked, and they were made to gargle with 15 ml of each gargling solution for one minute. Afterward, to remove the remaining gargling solution, they spit out saliva for one minute, and then the dental caries variables were checked again. Before gargling, the simplified oral hygiene index (S-OHI) was measured by equally checking the debris and calculus indices in the saline solution and chlorhexidine groups, and using the Alban test and a phase-contrast microscope, the amounts of coccus and inactive bacteria were measured. The subjects in group X1 gargled with 15 ml of 0.9% saline solution for about one minute while the subjects in group X2 gargled with 15 ml of 0.005% chlorhexidine for about one minute. After the subjects spit out saliva for one minute to remove the remaining gargling solution, the S-OHI was measured again, along with the amounts of coccus and inactive bacteria, again through the Alban test and the phase-contrast microscope. Using S-OHI, the buccal surfaces of the left and right maxillary first molars, the labial surfaces of the maxillary and mandibular central incisors, and the lingual surfaces of the mandibular left and right first molars were examined. The food debris and dental calculus at one tooth surface were examined. As a result, 0.0-1.2 indicated an excellent oral environmental condition; 1.3-3.0, a good oral environmental condition; and 3.1-6.0, a poor oral environmental condition. The Alban test is a test for measuring the incidence factor of Lactobacillus in saliva with a colorimetric method. A patient directly spit out saliva into a test tube containing a 5 ml medium to the extent that the surface of the agar was thinly covered, and the saliva was cultured for four days while the change in the color tone was observed every day. If the color of the test tube did not change, 0 point was given; if 1/4 of the test tube was yellow, 1 point; if 1/2 of the test tube was yellow, 2 points; if 3/4 of the test tube was yellow, 3 points; and if the entire test tube was yellow, 4 points. The higher the score, the higher the caries activity; thus, there is a risk of dental caries. To determine the kinds of microorganisms, a sterilized probe was used to collect supragingival and subgingival dental plaques from the mandibular left and right molar lingual surfaces. A slide was coated with dental plaques, and a drop of saline solution was put thereon. Then a slide cover was mounted on it to prevent bubbles from generating, and it was observed with a phase-contrast microscope (DCS6002, Doctor Prevent Co., Seoul, South Korea) at 4300 magnification. The microorganisms in the mouth that were alive were not stained, and their movements were directly and clearly observed through a monitor. The active and inactive bacteria were distinguished, and a relative increase of coccus indicates that there is a risk of dental caries. The statistical analyses of the saline solution and chlorhexidine groups were performed with IBM SPSS ver. 21.0 (IBM Co., Armonk, NY, USA). For a comparison of the amounts of coccus and inactive bacteria that were quantitatively analyzed with a program that analyzes the microorganisms observed under a phase-contrast microscope, the S-OHI, and the Alban test result between the saline solution and chlorhexidine groups, student t-tests were conducted at p=0.05. Before gargling, the S-OHI was poor in both the saline solution and chlorhexidine groups. The S-OHI value of the group that gargled with saline solution was slightly lowered but was still poor while the S-OHI value of the group that gargled with chlorhexidine was greatly lowered and became good (p<0.05) (Figure 1 and Table 1). Figure 1. Comparison of the S-OHI of the saline solution and chlorhexidine groups. X1: Oral care with 0.9% saline solution (1 min/15 ml); X2: Oral care with 0.005% chlorhexidine (1 min/15 ml). *The p-values were determined through a student t-test (p<0.05). Table 1. Comparison of the saline solution and chlorhexidine groups before and after gargling. Before gargling, the level of inactive bacteria was very low compared to that of active bacteria in both the saline solution and chlorhexidine groups. The level of inactive bacteria slightly increased in the group that gargled with saline solution, but the level of active bacteria was still higher, while the level of inactive bacteria in the group that gargled with chlorhexidine greatly increased, and the level of inactive bacteria was higher than that of active bacteria. Additionally, the amount of coccus decreased more in the chlorhexidine group than in the saline solution group (p<0.05) (Figure 2 and Table 1). Figure 2. 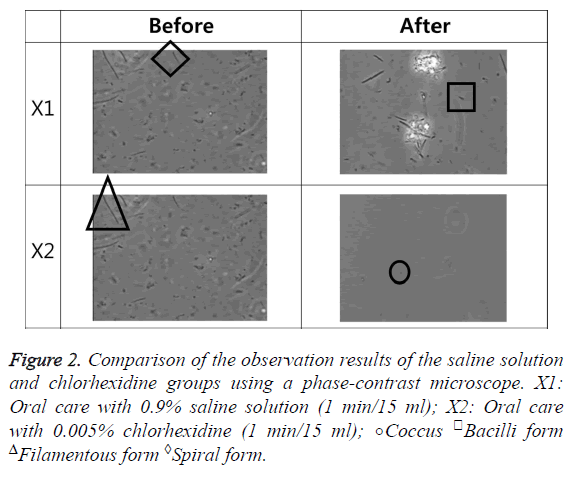 Comparison of the observation results of the saline solution and chlorhexidine groups using a phase-contrast microscope. X1: Oral care with 0.9% saline solution (1 min/15 ml); X2: Oral care with 0.005% chlorhexidine (1 min/15 ml); ○Coccus □Bacilli form ΔFilamentous form ◊Spiral form. Before gargling, with regard to the Alban test, the saline solution and chlorhexidine groups both fell under the low-risk group. The value of the group that gargled with saline solution was slightly lowered, but the group was still in the low-risk group, while the value of the group that gargled with chlorhexidine was greatly lowered, and the group was in a safe status (p<0.05) (Figure 3 and Table 1). Figure 3. 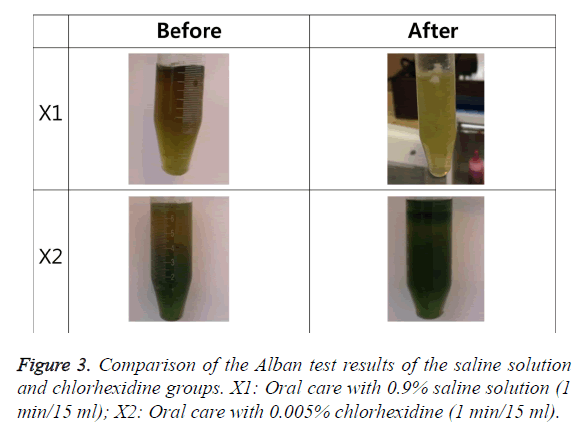 Comparison of the Alban test results of the saline solution and chlorhexidine groups. X1: Oral care with 0.9% saline solution (1 min/15 ml); X2: Oral care with 0.005% chlorhexidine (1 min/15 ml). Before gargling, there were no significant differences in the dental caries variables between the saline solution and chlorhexidine groups. After gargling, however, there was a significant difference between the two groups (p<0.05) (Table 1). The pathogens present in the oral cavity causes various diseases in the mouth and results in pain or loss of tooth. Among them, dental caries is a representative oral disease leading to loss of tooth if it is not treated, due to the phenomenon of decalcification of teeth in the process that pathogens in the oral cavity are attached to teeth and produce acids . The carries experience in the permanent teeth at the age of 12 decreased compared to that in the year of 2000 (Korean National Oral Health Survey. Ministry of Health and Welfare, 2012). However, as it commonly occurs compared to other diseases, and is not fatal, awareness and interest are low [16-18]. Once dental caries develops, it is not healed naturally, and continuously accumulated according to the morbidity level or amount . Therefore, for prevention, the biofilm on the tooth surface must be removed by a mechanical method like brushing , but according to Kim’s study , 44% of people, which is about a half of people, still brush twice a day in average, though teeth must be brushed more than three times a day. Moreover, 71% of people brush horizontally, and 63% of people do not clean between teeth. Like this, it is practically difficult to mechanically remove the biofilm on the tooth surface. Recently, in order to reduce bacteria causing oral diseases as well as to inhibit formation of biofilm on the tooth surface, many treatments using various drugs have been performed. In particular, chlorhexidine is most widely used as a subgingival cleaning solution . It is maintained for a long time in the mouth, and then is slowly isolated, thus a remarkable plaque inhibitory effect appears . Gusberti et al. and SoH et al. reported that the effect of root planning improved when the teeth were rinsed with 0.05% and 2% chlorhexidine respectively. Grossman et al. mentioned that 6-month-use of 0.12% chlorhexidine reduced plaque. Moreover, since chlorhexidine selectively suppresses the causative organism, Mutans streptococci, it is one of the most widely used drug in the field of dentistry, and the safety is also known to be high [27,28]. For chlorhexidine, it is recommended to gargle twice a day with 10 ml of 0.1~0.2% solution . However, according to a study result, when it is used persistently, chlorhexidine causes side effects such as burning sensation in the colored mucosa of the teeth, coloring in the tongue or teeth, etc. Additionally, it is not effective on the bacteria causing dental caries in the mouth . In addition, in Jung’s study , oral management was carried out with saline solution and chlorhexidine, and as a result, there was no statistically significant difference in the number of bacteria occurred in the mouth. Therefore, in this study, S-OHI, affecting development of dental caries, was observed with a low concentration (0.05%) of chlorhexidine. In the saline solution group, in comparison of before and after gargling, S-OHI slightly decreased, but the mouth was still in a poor condition, while in the chlorhexidine group the poor oral environment before gargling changed to a good condition after gargling. 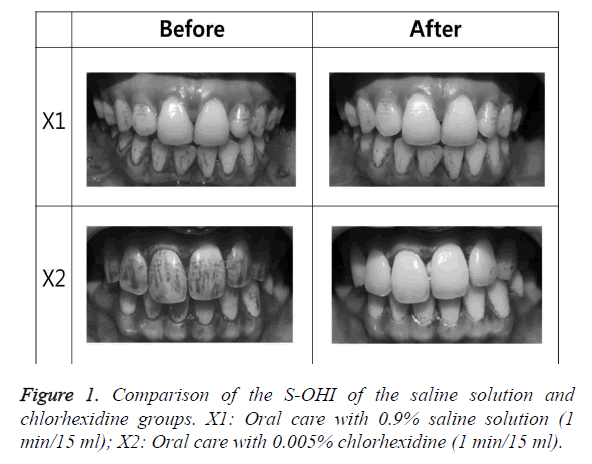 The result showed that chlorhexidine gargling improves S-OHI and prevents dental caries. As a result of observation on the biofilm on the tooth surface using a phase-contrast microscope, in the saline solution group, there were still more active bacteria than inactive bacteria after gargling, but in the chlorhexidine group, there were more inactive bacteria than active bacteria after gargling. This result was consistent with the outcome of Lee and Han , in which non-motile bacteria increased. In this study, the amount and activity of coccus, a causative organism of dental caries, both decreased as well, and chlorhexidine seemed effective on prevention of dental caries. Dental caries is a disease in which the hard tissue of tooth is lost as the surface of tooth is chemically dissolved by acids produced by bacteria . Caries activity test finds an influential factor for dental cries, which is especially working on each individual, and makes it possible to remove the factor, resulting in a high prevention effect as well as remarkable increase of individual oral health education effect. Therefore, its significance has been emphasized. There are many caries activity tests, but the Alban test performed in this study is highly related to clinical findings, relatively accurate, and can be conducted rapidly and easily . As a result of Alban test, the saline solution group was still in the row-risk group after gargling, while the chlorhexidine group changed to a safe condition from the row-risk group after gargling. The fact that gargling with 0.05% chlorhexidine for one minute alone makes the caries activity a safe condition indicates that chlorhexidine has a bacterial inhibition effect. Additionally, in all dental caries variables, there was no significant difference between two groups before gargling, but after gargling there was a significant difference between two groups. This result shows that chlorhexidine has a greater effect than saline solution not only on the biofilm on the tooth surface but also on reduction of pathogens in the mouth. Based on the results of this study, chlorhexidine has a broad antibacterial spectrum on gram-positive and negative bacteria, yeast, fungi, etc., is also effective on gingivitis and removal of plaque, and appears a strong antibacterial effect . This study revealed that the use of a low concentration, 0.05% chlorhexidine had effects on prevention of attachment of biofilm on the tooth surface and prevention of dental caries, as well as had strong and persistent antibacterial effects. The long-term effect of gargling will be confirmed later by comparing saline solution and chlorhexidine solution before and after gargling. Moreover, it is though that further studies must be conducted with regard to a side effect of chlorhexidine, which is coloring. This study had the following limitations: this study included only several dental caries variables in the chlorhexidine and the saline solution groups, thus limiting the generalizability of the results. To prevent dental caries, oral management controlling the biofilm on the tooth surface, reducing activity of coccus, and decreasing the acid production ability of bacteria is necessary. Therefore, this study implies that use of chlorhexidine gargling alone greatly contributes to prevention of dental caries as well as inhibition of attachment of the biofilm on the tooth surface. This study was supported by 2016 Research Grant from Kangwon National University. Lee SL, Kim JG. Anti-microbial activity of soybean extract against oral microbes. Kor J Env Hlth 2006; 32: 192-197. Hamada N, Takehara T. Virulence factors of Streptococcus mutans and dental caries prevention. J Dent 1984; 63: 407-411. Song JH, Ban SH, Kim JB, Ahn JH, Kim JC, Ha WH, Chang KW. Antibacterial effect of mouth rinsing solution against oral microbial species in Korea. J Kor Acad Oral Health 2007; 31: 482-488. Choi JM, Choi JY, Hwang KS, Park YD. Effect of oral environment improvement after using mouthwash containing cetylpyridinium chloride or triclosan. J Kor Acad Oral Health 2007; 31: 330-339. Lang NP, Brecx MC. Chlorhexidine digluconateab agent for chemical plaque control and for the prevention of gingival inflammation. J Periodont 1986; 16: 74-89. Delany GM, Patterson SS, Miller CH, Newton CW. The effect of chlorhexidine gluconate irrigation on the root canal flora of freshly extracted necrotic teeth. Oral Surg Oral Med Oral Pathol 1982; 53: 518-523. Olsen I. Denture stomatitis. Effects of chlorhexidine and amphotericin B on the mycotic flora. Acta Odontol Scand 1975; 3: 3341-3346. Sousa EO, Silva NF, Rodrigues FF, Campos AR, Lima SG, Costa JG. Chemical composition and resistance-modifying effect of the essential oil of Lantana camara linn. Pharmacogn Mag 2010; 6: 79-82. Tredwin C, Scully C, Bagan-Sebastian J. Drug-induced disorders of the teeth. J Dent 2005; 84: 596-602. Bopp M, Darby M, Loftin KC, Broscious S. Effect of daily oral care with 0.12% chlorhexidine gluconate and standard oral care protocol on the development of nosocomial pneumonia in intubated patients. J Dent Hyg 2006; 80: 9. Houston S, Hougland P, Anderson JJ, LaRocco M, Kennedy V, Gentry LO. Effectiveness of 0.12% chlorhexidine gluconate oral rinse in reducing the prevalence of nosocomial pneumonia in patients undergoing heart surgery. Am J Crit Care 2002; 11: 567-570. Thomas E. Efficacy of two commonly available mouth rinses used as preprocedural rinses in children. J Indian Soc Pedod Prev Dent 2011; 29: 113-116. Pedreira MLG, Kusahara DM, Brunow de Carvalho W, Nunez SC, Peterlini MAS. Oral care interventions and oropharyngeal colonization in children receiving mechanical ventilation. Am J Crit Care 2009; 18: 319-328. Lee KH, Park HK, Kim JH. Effects of oral care with 0.1% chlorhexidine and tantum solution on the oral status and incidence of oral pathogens among intubated ICU patients: A pilot study. J Korean Crit Care Nurs 2010; 3: 25-35. Rim SS, Kim YK. A study on the effect of fluoride varnish application in remineralizing incipient enamel carious lesion. J Kor Acad Ped Dent 1993; 20: 131-144. Han JS. A Study of the relation between the management of the deciduous teeth and the parents knowledge. J Kor Dent Assoc 1974; 12: 655-664. Park KJ. Evaluation on the knowledge and control method of the dental health in rural residents. J Kor Dent Assoc 1976; 14: 919-931. Chin KH. The experimental study on the effects of the direct group oral health education. J Kor Dent Assoc 1975; 13: 127-131. Kim JB, Paik DI, Moon HS, Ma DS. A Study on the percentage of extraction required by causes in Korea. J Kor Acad Dent Health. 1995; 19: 17-28. Kim YR. A Comparison of Oral Health Behavior and Oral Health Outcomes between Cooperative and Non-Cooperative Groups following Implementation of an Oral Health Care Program. J Dent Hyg Sci 2017; 1: 30-37. Greenstein G: Effects of subgingival irrigation on periodontal status. J Periodontol 1987; 58: 827. Rolla G, Loe H, Schiott CR. Retention of chlorhexidine in the human oral cavity. Archs Oral Biol 1971; 16: 1109. Gusberti FA, Siegrist BE, Lang NP, Syed SA. Microbial effects of chlorhexidine digluconate irrigation on the subgingival microflora in patients with advanced periodontitis. J Dent 1985; 64: 360. Soh LL, Newman HN, Strahan JD. Effects of subgingival chlorhexidine irrigation on periodontal inflammation. J Clin Periodontaol 1982; 9: 66. Grossman E, Reiter G, Sturzenberger OP. Six-month study of the effects of a chlorhexidine mouthrinse on gingivitits in adults. J Periodont 1986; 21: 33. Emilson CG. Susceptibility of various microorganisms to chlorhexidine. Scand J Dent 1977; 85: 225-265. Emilson CG, fornell J. Effect of toothbrushing with chlorhexidine gel on salivary microflora oral hygiene and caries. Scand J Dent 1976; 84: 308-319. Briner WW, Grossman E, Buckner RY. Effect of chlorhexidine gluco nate mouthrinse on plaque bacteria. J Periodont 1986; 21: 44-52. BI, Jung WC, You SJ, Lee CW, Kim JS, An SY, Jeon BH, You YO, Kim KJ. Inhibitory effects of galla chinensis extract on cariogenic properties of streptococcus mutans. J Physiol Pathol Korean Med 2015; 29: 189-194. Lee EN, Ok JH, Park HS, Kim SM, Park MJ, Lee YJ, Jang MR, An HN. Comparison of oral hygiene effects between 0.1% chlorhexidine and normal saline on the incidence of oral pathogens. J Korean Acad Fundam Nurs 2006; 13: 351-358. Lee KH, Han DS. The effects of chlorhexidine using pattern with periodontal pack on clinical and microbiologic parameter after periodontal surgery. J Periodontal Implant Sci 1994; 24: 376-389. Imfield T. Dental erosion. Definition, classification and links. Eur J Oral Sci 1996; 104: 151-155. Kim JG, Kim YS, Beak BJ, Yang YM. Relationship between salivary caries-related tests and dental caries experience in Korean dental college students. J Kor Acad Ped Dent 2005; 32: 67-74. Koeman M, Van der Ven AJ, Hak E, Joore HC, Kaasjager K, de Smet AG. Oral decontamination with chlorhexidine reduces the incidence of ventilator-associated pneumonia. Am J Respir Crit Care Med 2006; 173: 1348-1355.